4297-RB-DST is rated 4.1 out of 5 by 17. 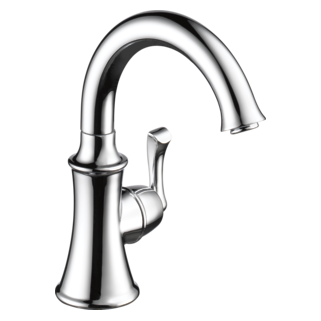 Rated 4 out of 5 by austerina from side spray is weak All in all I am satisfied with this faucet. It looks nice and is easy to clean. The faucet itself gives good water pressure. The side spray however is weaker than I would prefer - I most often use the side spray to clean the sink itself and I have to lower it to the level of any food remants to be able to push them towards the drain. My old (much cheaper) side spray didn't require the extra effort. I wish there was a way to enhance the spray power. 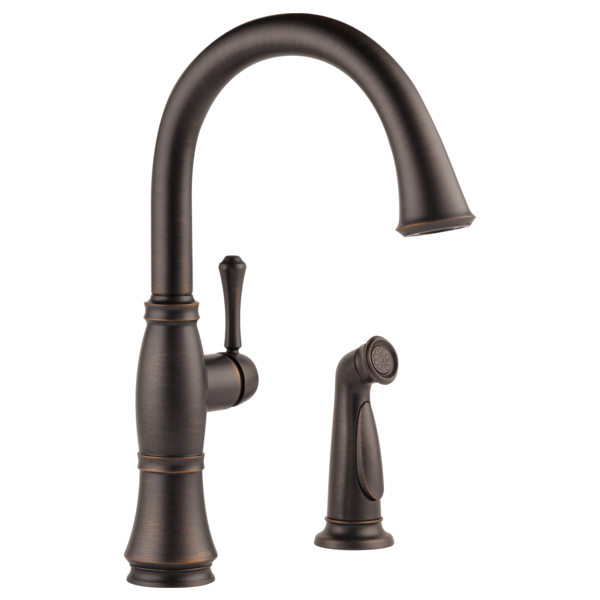 Rated 5 out of 5 by Pat from Delta cassidy Kidchen faucet I am very happy with this product. It is very attractive and functional as it allows room for tall pots to fill up with water and to rinse and wash out easily. The spray is helpful to clean out the sink and remove any stuck on particles on dishes or cookware. It is easy to clean and looks great. Rated 5 out of 5 by Paul0630 from Love our new Cassidy Kitchen Faucet. 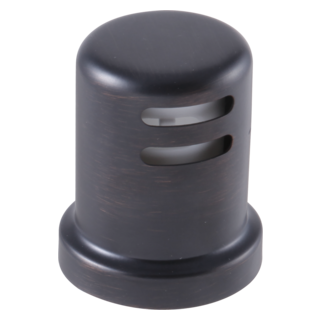 Beautifully crafted and functions great. Need to make it clearer which way is hot and which way is cold, but after using a few times, it will become automatic. Also, the side sprayer is great and very handy. Rated 3 out of 5 by Big E from Great Faucet - Bad Sprayer We've had this faucet for a couple years now. 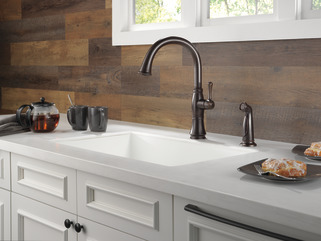 Love the faucet itself - looks great and no issues. However, the side sprayer is plastic and comes with a lame cheapo plastic supply hose. (our old Groh that this replaced had a metal braided hose that was flexible and awesome! Take note Delta.) Because the hose takes the shape of whatever it runs into under the sink (in our case the plumbing supply connection) it becomes difficult to pull out or put back. Due to the bi-directional resistance, the housing that fits to the countertop keeps coming loose (as other reviewers have noted.) Delta needs to upgrade the supply hoses for the side sprayers. Kind of ridiculous when you are paying almost 400 bucks for a faucet. Rated 3 out of 5 by Mark in SA from Sprayer assembly constantly loose I like the faucet with one very notable exception. The sprayer assembly constantly comes loose. I had the faucet installed by a plumber, this was not a DIY project. The sprayer assembly just keeps coming loose. I tighten it and, within a day or two, it is lose again. Instructions say to hand tighten only, but it seems totally ineffective. Very disappointed to have the piece that holds the sprayer constantly sliding around. Would love to learn how to fix this. Thought maybe the installer left off a lock nut or something but, reading through the install guide, that doesn't seem to be the case. Rated 2 out of 5 by Marylou from Loose Handle We installed this faucet 2 weeks ago and the handle is already loose!! We had a professional install it so I don't think it has anything to do with installation, very disappointed! 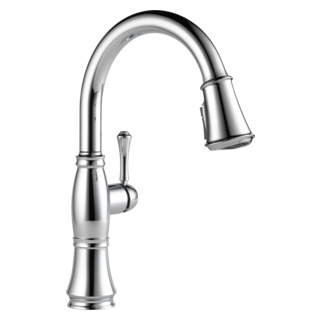 Rated 2 out of 5 by Kathy2018 from Cassidy faucet Bought this 6 months ago loved it ,then lost all water from faucet,sprayer works without any issues. Any suggestions? what tool do you need to remove the female aerator from the faucet? Is the sprayer metal or plastic? Can this faucet, with the sprayer, be installed, with a soap dispenser, on a 3-hole sink? Thank you for your question. 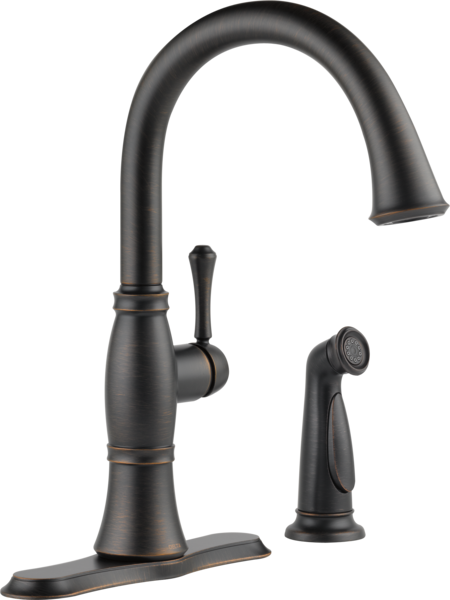 Delta Faucet model # 4297-DST is a 2-hole installation but you if have 3 holes, you can add a soap dispenser for your third hole. 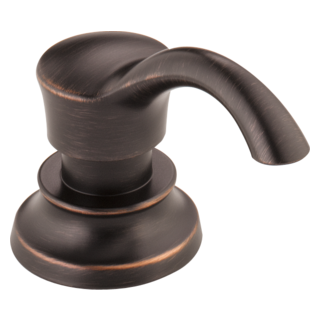 We recommend Delta Faucet model # RP37039 but any soap dispenser will work. I have been trying to see if the aerator adaptor rp51505 will fit on this product. I have both parts and they do not seem to fit together. If not what size adaptor do I need? What metal is the body of the faucet made of? also like to know if this faucet has a ceramic disk cartridge or or a compression valve? If I can get an adapter, which part should I order? The Cassidy pull down hose is 62&quot; and the side sprayer is 48&quot;, are these both measured from the normal resting position? I am trying to determine if they will both satisfy my needs or if I have to get the pull down. I really want the side spray type. I am trying to determine the reach of the hose.